By my sun and my stars, what great news! Just last month rumors of casting for the brutish Drax the Destroyer in the new Marvel Guardians Of The Galaxy movie had narrowed the part down to three actors. Allegedly Isaiah Mustafa, Brian Patrick Wade and Dave Bautista were up for the part. But thank goodness Marvel threw them all out when the stallion who mounts the galaxy showed up. 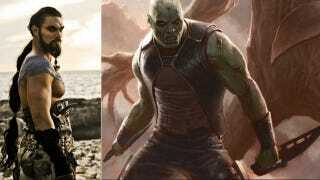 According to Latino Review's sources Jason Momoa walked away with the role of Drax moments after he auditioned. Hell yeah Drogo! This Guardians Of The Galaxy cast is shaping up pretty nicely.